But the residue of Livni’s fast fading political prospects doesn’t reside on the Jewish national side of the ideological divide. She, therefore, woos the few voters who maybe might, irrespective of her record, still stick by her. So, fresh from seeing another of her pretentiously flaunted peace projects come miserably a cropper, Livni pledged to spare no effort to shoot down the Basic Law Netanyahu wants included in Israel’s proto-constitution. His foremost objective is to prevent further distortions by a hardly impartial judiciary that indulges in elaborate interpretations decreed by a tendentious political agenda. “Just as I opposed such initiatives in the past, I will do the same [again], and it doesn’t matter who is proposing it,” she vowed, taking obvious potshots at Netanyahu. To be sure, Livni does have a dishonorable history of opposing precursor proposals to what Netanyahu now endorses. Less than a year ago she appointed law professor Ruth Gavison to draft a constitutional provision defining the precise implication of Israel’s “Jewish and democratic” attributes. With typical hubris and fanfare Livni at the time insisted that this is the “first-ever comprehensive effort” to grapple with the thorny controversy. That was the last we heard of her dud PR stunt. Livni shamefully roped in Gavison – an Israel Prize winner, a gifted and much-esteemed jurist and a past candidate for Supreme Court justice – to help foil legislation geared to firmly secure the Jewish-state characterization and accord it preference in judicial deliberations. Ironically, such legislation was first sponsored by none other than MK Avi Dichter, then of Livni’s own Kadima faction. Dichter’s original bill was eventually resubmitted, in an appreciably softened version, by MKs Yariv Levin (Likud) and Ayelet Shaked (Habayit Hayehudi). Caught in an obvious deception, Livni was forced to back down. Her amended account was that Netanyahu knew about Gavison’s appointment but didn’t support it. The bottom line is that Netanyahu for a while let Livni busy herself with whatever alternative formulations Gavison might concoct for her but he made it abundantly clear that these by no means oblige the government, the prime minister or any other minister. Now Netanyahu himself has picked up the ball previously tossed into the Knesset arena by Dichter, Levin and Shaked. Now Livni is livid. Netanyahu’s announcement gives the definitive and incontrovertible lie to her contention that he backed her opposition to the Jewish nation-state bill. But that wasn’t the only instance in which Livni bent the truth in this context. Her prattle about the parity between “democratic” and “Jewish” elements in the Declaration of Independence is utter hokum. Bamboozled members of the public may be unaware that pretensions of parity are bogus but Livni is unlikely to be as clueless. Hence, it’s hard to avoid the conclusion that she’s simply disingenuous. Sadly, Israel’s Declaration of Independence has become the proverbial rope in a curious political tug-of-war. It all has to do with the “democratic and Jewish” catchphrase that has gained broad but unfounded acceptance as the Declaration’s bipolar blueprint for the state’s character. However, the plain and irrefutable fact is that the word “democratic” doesn’t even appear once in the Declaration. The carefully composed document only cursorily lists assorted individual freedoms (distinct from collective/national ones), “as envisioned by the Prophets of Israel.” Considering the authors’ meticulous attention to every nuance during a series of ultra-exhaustive consultations, this omission was no accident. Because the Declaration is so often misquoted – because the Livnis in our midst promote a spurious debate on what weight ought to be accorded “democratic” versus “Jewish” components and whether they can at all coexist – we’d do well to delve into how this seminal Israeli text came to be. The current trend is to use the Declaration to validate ultra-liberal excesses, claiming these to be the spiritual legacy of the Declaration’s presumably postmodern progenitors. To hear latter-day rationalizations, the “Jewish” references in the Declaration were at most incidental and they too smacked of racism – as if a state for the Jewish people perforce negates elementary justice. Those who spread such fallacies prefer we ignore history. The UN Partition Resolution of November 29, 1947 demanded extensive legal and administrative groundwork from both the Arab and Jewish states earmarked to replace the British Mandate. The Arabs, who rejected partition, prepared for war to destroy the burgeoning Jewish state. The Jews took their legalistic obligations in scrupulous earnest. The preliminary draft of the Declaration of Independence was completed on May 10, 1948. It contained all the constituents that would feature in the final version but the phrasing was different. Not a single one of its sentences survived. The word “democracy” appears there once, in the fifth paragraph only. Its glaring absence from subsequent revisions indicates that it was erased and deliberately so. This is vital to note, especially given the endless quibbles and quarrels that ensued among the Declaration’s hair-splitting framers over every shade of meaning and fragment of a potential connotation. 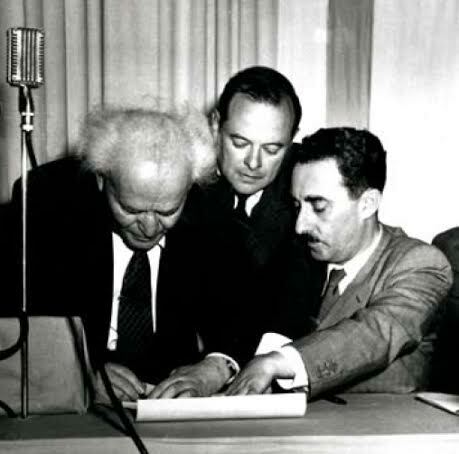 Moshe Sharett, in time Israel’s second premier, headed the committee that drafted the second version. It was debated on May 13, less than a day before independence. It contained 22 laborious paragraphs – 12 of which opened with “whereas.” At this point the word “democracy” had already been expunged from the text. Ben-Gurion himself repeatedly stressed that “this is no constitution,” and that the terse reference to civil liberties was required by the Partition Resolution. “We inserted the basic elements demanded of us by the UN,” he explained to members of the Provisional People’s Council (the embryonic parliament), who approved the final version in two rounds of voting, literally just hours before independence was proclaimed. Nonetheless, in recent years, the Supreme Court has treated the imaginary conjoined “democratic-Jewish” adjective as an unassailable quasi-constitutional directive. Moreover, the justices habitually assign substantially greater weight to “democratic” than to “Jewish.” This is an egregious misreading, assuming that the original had at all been perused. Critics of the Court’s interventionist proclivities fear that this dynamic might turn Israel into an amorphous “state-for-all-its-citizens” rather than the Jewish nation-state. Even the great Ben-Gurion didn’t dare to assume sole responsibility for what he insisted (with considerable foresight) was not a constitution-in-disguise. All the more so, constitutional authority cannot be conceivably claimed for Livni’s self-serving affectations. She obviously isn’t constrained by Ben-Gurion’s sense of circumspection. He treated every iota of every detail in the text with pedantic judiciousness. Livni is his antithesis. She knows best. Her lack of humility imparts the impression that she won the last elections by a whopping landslide and represents the majority’s vox populi. That this isn’t so – not even remotely so – is in her worldview fundamentally unfair. In her constant search for relevance, Livni has once more determined that she is wiser than anyone else. I don’t think she does much damage. Do people really listen to her? The state of Israel is Jewish and it is one. This is the very essence of Zionism and the future of the Jewish people. Israel has come a long way since 1948 and it has succeeded beyond every expectation, now is the time, to secure it’s Jewish identity and it’s hold on the land. A very thoughtful sentiment my dear nephew…. These guys may be more Jewish than Livni, Sarah, and they’ll soon be here gracing our humble land and helping us to forget about the evil Tzipporah…..
Thanx my dear uncle ! Perhaps the penny will/may drop if Tzippy sees and hears the link below? But then, I wouldn’t be surprised if she stands at attention when she hears and sees the video. I, for one, would like to know precisely what values Netanyahu was referring to, when he implied that Democratic values should not necessarily be subordinate to Jewish values. (for example?) Thus, I’m not entirely sure what’s at issue here; except that Livni’s lack of integrity is no surprise. She comes from the “cult of personality” crowd; thus something is true because she says so. However, what would Livni say to the idea that Israel’s Prime MInister be given the power to appoint Supreme Court justices? Probably nothing too positive.